This configuration is for EDI/Packaging Manager setup of the UPS WorldShip® ONLY. The following setup procedure is for UPS WorldShip® to use the Acctivate EDI/Packaging Manager module. If you have not purchased this module please refer to the UPS WorldShip® Installation for Non EDI/Packaging Manager setup. Regardless of your configuration the setup typically can be completed in less than one hour. Configuring UPS WorldShip® to Import data from Acctivate. Next, you must be logged into your shipping workstation, launch the UPS WorldShip® software. The Create or edit an import or export map window will pop-up. In the New Map section of this window, select the Import from ODBC Database radio button. Then select Shipment from the drop-down menu in the bottom-center of the screen. Next, in the Name field near the bottom of the window, type ‘Acctivate Shipment’ for your import name. Click the Create button to the right of the Name field. PLEASE NOTE: UPS requires a 32-bit ODBC data source. Next, enter the correct Login ID and Password to connect to SQL Server. Click OK. Password: Contact support if you need assistance with this. The password may have been changed during the installation or configuration of SQL Server. If these settings do not work, please contact your database or network administrator to gain access to this database. Then Edit ‘Acctivate Shipment’ Import map window will pop-up. In this window you will map fields from Acctivate into WorldShip. This allows WorldShip to have access to your that are ready to ship. Select the ODBC Tables drop-down menu, located on the top left side of the screen, and select the Shipment Summary table. There are often similarly named table names or field names in this system. Please make certain that you have selected the fields exactly as they are listed. Make certain that the WorldShip Fields drop-down menu (the right column) is set to Shipment Information. Complete the mapping assignments on the following page. At this point, you are ready to begin mapping ODBC tables to WorldShip Fields, using the mapping list on the following page. This is the most crucial stage of the configuration process. It is critical that you have the correct ODBC table name and WorldShip Field selected when you click the connect button. The matching ODBC table name and WorldShip field are a mapping set. Single-click on the table name in the ODBC Table (left column). Single-click on the corresponding WorldShip field (right column). Click the Connect button. This will map the two fields together. Repeat this process for each of the boxes shown below. Confirm WorldShip Field – Shipment Information is selected before mapping the following fields. Select WorldShip Field – Ship To and map the following. Select WorldShip Field – Package and map the following fields. Select ODBC Table – ShipmentPack and map the following fields. The final step for importing data from Acctivate into UPS WorldShip is to define a primary key for importing. While in the ShipmentSummary table, select the ShipmentNumber column name and click the Define Primary Key for Import button. When this is done, a key icon will display to the left of the ShipmentNumber row. Now you must ‘Relate’ ShipmentSummary and ShipmentPack tables in UPS. Highlight the ShipmentSummary table and the ShipmentNumber field. Highlight the ShipmentPack Table and the ShipmentNumber field. Click OK in the Edit ‘Acctivate Shipment’ import map window to confi rm the mapping. Also, click OK in the Create or edit an import or export map window. The Select map from list for import window will pop-up. Select the Acctivate Shipment line so that it is highlighted. Click the Import button to allow for automatic imports from Acctivate to WorldShip. This will display the Enter import key box in WorldShip that you will use to open each Acctivate order in UPS WorldShip. Orders ready to ship are available to be opened by entering the Acctivate Sales Order Number in this window and then using the TAB key to retrieve the order information. Configuring UPS WorldShip® to Export data to Acctivate. The next step in this process is to map information from WorldShip back into Acctivate. This is done through an export map. Create another Map using the Import/Export Data > Create/Edit Map window. This will be done in order to export data from WorldShip. The Create or edit an import or export map window will pop-up. The new map is created the same way as the first map, except you will select the export radio button instead of the import radio button. In the New Map section of this window, select the Export data from WorldShip radio button. Then select Shipment from the drop-down menu in the bottom-center of the screen. Next, in the Name field near the bottom of the window, type Acctivate Package for your export name. A pop-up window entitled Select an ODBC source will appear in the middle of the Create or edit an import or export map window. **The password may have been changed during the installation or confi guration of SQL Server. If these settings do not work, please contact your database or network administrator to gain access to this database. The Edit ‘Acctivate Shipment’ Export map window will pop-up. When doing the export mapping, you will make connections in the opposite order that you did in the import mapping. Fields will be mapped from WorldShip into Acctivate. This allows WorldShip to send shipment information directly into your Acctivate system. Select Shipment Information from the drop-down list in the left column (WorldShip Fields). Select tbOrderPackagesText from the drop-down list In the right column (ODBC Tables). In these drop-down lists many similar names are listed near each other. Please be certain that you have selected the fields exactly (letter for letter) as they are listed above. For example, in the ODBC tables drop-down menu you will find a listing for both tbOrderPackages and tbOrderPackagesText. However, they are not the same and they must not be confused. Do not select tbOrderPackages. Click on the Column Name column to sort the column names in alphabetical order. Also, click on the Field column twice in the WorldShip Fields to arrange the fields in alphabetical order. Complete the following mapping assignments. At this point, you are ready to begin mapping WorldShip Fields to the corresponding ODBC table using the mapping list on the following page. 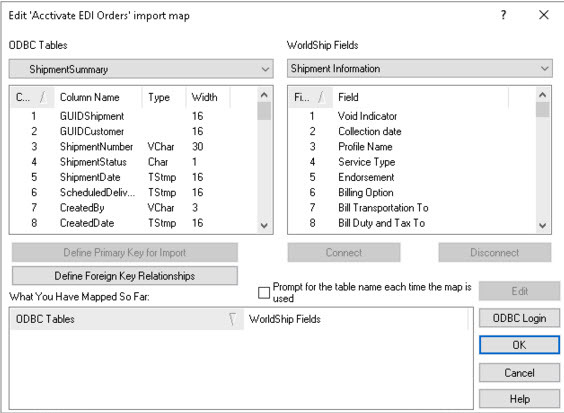 Export Mapping from WorldShip to ODBC table. Single-click on the corresponding WorldShip field (left column). Single-click on the table name in the ODBC Table (right column). * Acctivate only works with this other handling charge and we do not support any of the % handling options. If you need other handling charges added to your customer invoices then you can manually enter the amount on the ‘Release for Invoicing’ window in Acctivate. You should still map this field. Select WorldShip Field – Ship From and map the following fields. * You may select ‘Package Negotiated Rates Charge’ if you have a negotiated rate with UPS and you want this rate to appear on your customer invoice. ** Refer to the Optional Setup section of this document if you do not want shipping charges to appear on your customer invoices. You still need to map this field. Once all of the WorldShip fields have been mapped to the appropriate Acctivate Column Name, simply click the OK button to close the export map windows. Now that all of the tables and fields are mapped together, Acctivate and WorldShip can pass information about orders/shipments back and forth. Orders that are ready to ship in Acctivate will be readable by WorldShip. You must configure WorldShip to automatically send (export) information back to Acctivate when the shipment has been processed. At the main UPS WorldShip window, select Import/Export Data > Automatic Export After Processing Shipment > More… from the file menu. The Select map from list for export window will pop-up. Select the Acctivate Package // Shipment line so that it is highlighted. Click the Export button to allow for automatic exports fromWorldShip to Acctivate. The final step in the UPS WorldShip configuration for Acctivate is to develop a profile in WorldShip. Click on the Tools > Profile Editor menu link. The Profile Editor Enhancements window may pop-up (It may be selected to not appear). If it does appear, click OK. The Profile Editor window will appear. This looks like the normal WorldShip window, however you will have different button access and grayed-out options in the drop-down menus. Enter a new Profile Name in the profile name field or choose a profile that has previously been setup. This can be anything that you want. Select your standard shipment methods and other defaults for this profile. Click the Reference Tab in this window. Check all of the use on all packages checkboxes except for reference number 3. This step will allow integration of multiple packages. Click Save Profile. Then click close. The normal UPS WorldShip window will return. In the drop-down profile menu (located at the bottom of the screen), select your new profile. You should always use this profile on your shipments. You have now successfully configured UPS WorldShip to interface with your Acctivate system. What if I do not want to add Freight to my customer invoices? You can setup Acctivate to where Freight Charges are not added to the customer invoice but you can still see the Freight Charges as they were calculated in UPS WorldShip on the Sales Order – Packages tab. You can always manually enter the Freight Charges on the ‘Release for Invoicing’ window if you need to make an exception. To configure this option complete the following Steps. 1. Open Acctivate and select File – Configuration Manager – Sales Order – Carrier Billing Option. 2. Select ‘Edit’ from the toolbar and uncheck the “Include On Invoice” box on the “Bill Shipper Freight” row. This means the shipper (you) will be billed for the Freight and the shipping charge will not be added to the customer invoice. 3. Save and close the Configuration Manager window. What if I added new Carrier Service Types in Acctivate? 1. Click the Edit button on the Edit ‘Acctivate Orders’ Import map window. 2. The Mapping Connections into Shipment Information window will pop-up. Click the Translations button. 3. Select Service from the Select a common map window that will pop-up and click OK.
4. In the Mapping Connections into Shipment Information window External field enter the Service type as it is in Acctivate. In the WorldShip Field enter the name UPS uses for that same service type. For example, Acctivate uses the Carrier Service ‘Ground’, while UPS uses ‘Ground Service’. Click the Add button to add both to the list. 5. Select the Services added in step 4 and click OK.
6. Repeat steps 4 – 5 for each Service. In the drop-down Profile menu (located at the bottom of the screen), select your Acctivate profile. You should always use this profile on your shipments. 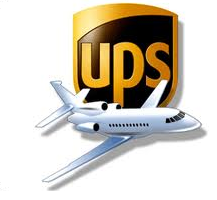 At this point, you will use UPS WorldShip in its typical manner to process the shipment and print the label. When the order is released for invoicing in Acctivate the shipment information will appear in a new window. If you accept the charges it will add it to the invoice, otherwise modify the charges on this screen. If you require further assistance, from your Acctivate system select Help > Acctivate Support > Request Support to submit a support request.